The largest of Manchester Airport's three terminals, T1 serves millions of travellers flying from this major international hub each year. Starting your trip with Manchester Airport parking booked through APH will help ensure departure day is a stress-free experience for you and your party. Use this guide to explore all airport parking options, including the likes of park and ride, on-airport and meet and greet services. Use the tabs below to reveal the information you need to select the perfect Manchester Airport parking for your trip from Terminal 1. With unrivalled experience in the airport parking business, we know a one-size-fits-all service won’t work for all travellers – which is why this guide will help select the solution that's perfect for your trip! 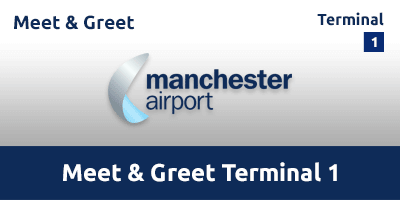 APH offers a wide variety of products to ensure you get the ideal parking at Manchester Airport Terminal 1, so whether its park and ride from APH Car Park, on-airport from Manchester Airport Multi Storey Terminal 1, or meet and greet from the likes of Meet & Greet Terminal 1, we’ve got departure day covered for all. Take a look at the table, below, for an overview of Manchester Airport Terminal 1 parking available through APH. Millions of travellers fly from Manchester Airport Terminal 1 each year and with a large number of them accessing it by car, there’s always a risk from unscrupulous operators attempting to cash in. This is why the Park Mark Safer Parking Award offers such an essential service for travellers looking for the best deals from legitimate providers at Manchester Airport Terminal 1. Don’t take the risk of leaving your vehicle in the hands of rogue operators, simply play it safe by looking out for the Park Mark Safer Parking Award when booking space for your trip from Manchester Airport. 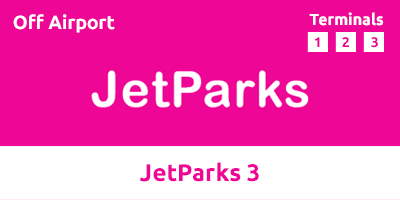 Services provided through APH, such as Jet Parks 1, hold the Park Mark Safer Parking Award to highlight safe, legitimate parking providers at Manchester Airport’s Terminal 1. The Park Mark Safer Parking Award ensures travellers flying from Manchester Airport Terminal 1 – can easily park with confidence. As a Police Crime Prevention Initiative, the Park Mark Safer Parking Award is designed to help cut the instances of actual crime or the fear of it in car parks across the UK as a whole. APH is a proud supporter of the Park Mark Safer Parking Award and its mission to ensure safe and legitimate Manchester Airport Terminal 1 parking for all travellers. Look for Park Mark Safer Parking Award-holding car parks on the official site here. Alongside the Park Mark Safer Parking Award, APH offers a full and independent set of reviews for each product offered. With free and easy access to these independent reviews, APH customers can find honest insights into the Manchester Airport parking products they’re considering. All reviews are collected and published through independent provider Reevoo to ensure travellers get a full and uncensored overview of the company – and not just the sanitised and edited version offered by some retailers. Reevoo guarantees product reviews published on the APH website have not been edited or individually selected to deliver an unduly positive impression. With reviews handled only by Reevoo, you’re sure to get the full picture. 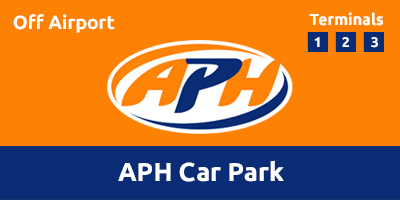 Check out reviews for parking services, such as APH Car Park, at Manchester Airport Terminal 1. Along with safe and secure parking at Manchester Airport Terminal 1, APH works hard to provide services at the cheapest available price. Here we look at some of the real-world tips that can genuinely help cut the cost of parking for your next trip from Manchester Airport Terminal 1. Securing genuine savings on your parking at APH is simple and instant – with a saving of at least 10 per cent possible without having to move from where you're sitting right now! That’s right, travellers can enjoy a saving of at least 10 per cent on their next parking booking – and all subsequent reservations. Just join our email mailing list and grab your saving, now. Savings are instant and signing-up is fast and easy with APH. You’ll also get advance notice of sales, deals and competitions. Claim your discount by scrolling to the bottom of this page where you can enter your email address in the space provided. Hit send and you’re ready to claim a 10 per cent saving on all Manchester Airport Terminal 1 car parking offered by APH. Along with bagging a 10 per cent discount just for signing up to the APH email mailing list, we can give savvy travellers a helping hand to save more cash for little effort. We all know the cost of airport parking varies across the year; with higher charges for popular travel periods including the likes of school holidays and Bank Holidays. However, with the help of APH, you can not only travel during these periods but also secure significant savings compared with what other travellers might be paying for identical parking. We’ve been parking cars at airports over four decades, which means APH has a wealth of historical pricing data that can reveal the cheapest time to book parking at Manchester Airport Terminal 1. While many retailers want such data to remain secret, APH is keen to share it and help our loyal customers secure cheap Manchester Airport Terminal 1 parking during peak periods. Our data reveals booking Manchester Airport Terminal 1 parking six months before leaving could be around 62 per cent cheaper than a reservation made just seven days before flying. 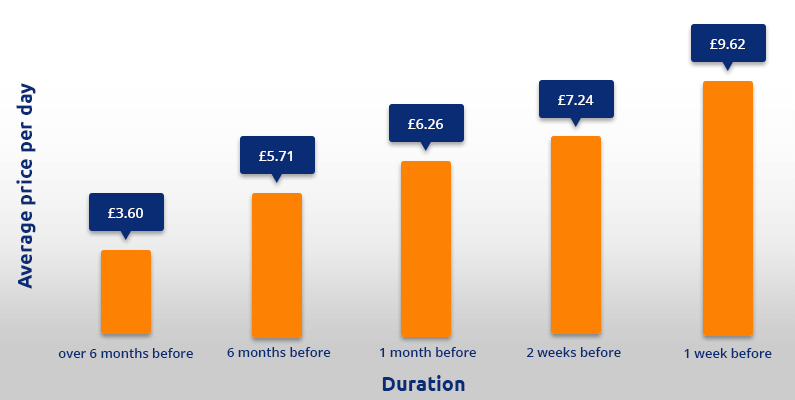 Putting that in stark cash terms, securing a week’s parking seven days before you fly could cost around £76.96 but making the same reservation six months out could cost just £28.80 – a significant saving of £48.16. Not everyone can book six months ahead but making your reservation as soon as possible will typically deliver a healthy saving. Use the graph below to work out potential savings obtainable depending on when a booking is placed with the likes of APH Car Park. Another cash-saving strategy comes from booking park and ride parking – from the likes of Jet Parks 2. This type of parking is safe, secure and offers some of the cheapest services for Manchester Airport Terminal 1. Here’s the great-value parking we currently offer at Manchester Airport Terminal 1. Ensuring a stress-free departure day is easy with APH. Here we look at the types of parking available and how you can select the perfect start for your trip. Here’s our at-a-glance guide to the various types of parking, followed by a full description below. Here is all you need to know about finding the perfect Manchester Airport Terminal 1 parking for your trip. If you’re looking for a fast and fuss-free departure day, on-airport parking from the likes of Manchester Airport Multi Storey Terminal 1 could be the solution you’re after. Located within the airport complex – typically just a couple of minutes’ walk from the check-in desks – this type of parking offers a legitimate security-protected service at a cost-effective price. Simply drive to the airport, head into the car park, locate a space then take the short stroll to Terminal 1. Drivers will be able to keep their keys, with vehicles remaining in the same space throughout the owner’s absence. On-airport car parks also benefit from tight security you’d expect within a major international. Additionally, all of the on-airport car park services offered by APH are recipients of the Park Mark Safer Parking Award. Best for: Travellers who like to keep things fast, simple and predictable will love on-airport parking. No searching for unfamiliar car parks or squeezing onto busy transfer buses – just a short stroll to the Terminal 1 check-in area. Mid-priced parking that’s great for returning travellers, too. Smart travellers looking for cost-effective parking without compromising on safety and security will find our off-airport parking services a perfect match. Typically located around 10 minutes from the check-in area, services such as APH Car Park bring legitimate cheap Manchester Airport Terminal 1 parking to all travellers. Off-airport parking is easy to use, too. Just drive to the car park – no more than 10 minutes from the Terminal 1 building – check-in, unload your bags and hop on one of the frequent transfer buses heading to the check-in desks. Using off-airport parking services reserved through APH ensures your car will be parked in a security-protected car park while you’re travelling. Measures will include the likes of CCTV, security fencing and barriers with patrols through the day and night. The majority of off-airport park and ride services offered by APH are holders of the Park Mark Safer Parking Award. Best for: Ideal for all travellers searching for cheap airport parking for Manchester Airport Terminal 1. And there’ll be no cutting corners with security either. Users will need to add a few minutes travel time, but the added investment in time will return big savings. Meet and greet parking will help Manchester Airport Terminal 1 users save time by skipping park and ride transfer buses and the need to search for a vacant bay in busy on-airport car parks. It’s not just about saving time – booking meet and greet parking from the likes of Meet & Greet Terminal 1 also delivers a stress-free departure day. No need for off-airport excursions, or time-consuming transfers to the check-in area – just set your sat-nav straight for the terminal! Drive to a pre-arranged meeting point – just a short stroll from the terminal doors – hand your keys to the uniformed driver, unload your bags and get checked in. Your car will be parked in a security-protected compound while you travel. All meet and greet services provided by APH hold the Park Mark Safer Parking Award. Best for: Ideal for those travelling with kids, disability or bulky sports gear. 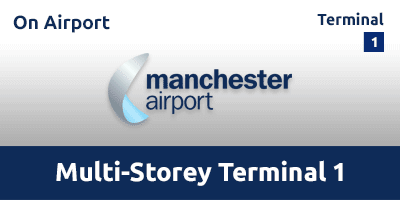 Easy, fast and stress-free is the headline for this Manchester Airport Terminal 1 parking experience. Few of us eagerly await the morning alarm – and combining your wake-up call with a trip to the airport is not the ideal start to any holiday. With the added anxiety of rush-hour delays, unexpected road closures and unfamiliar navigation to deal with, getting to the terminal on time is often a daunting experience for many! However, savvy travellers are skipping the early morning airport dash by booking a pre-flight stop-over at one of the nearby airport hotels. Swap the early morning alarm and rush-hour battle for a lie-in and leisurely breakfast. Pairing your parking with a hotel room can, in many cases, add just a few pounds to the amount you’ll pay. Find out more about hotel and parking packages at Manchester Airport Terminal 1 and how it could be the perfect start for your next trip. Get ready for your journey from Manchester Airport Terminal 1 by preparing a route to your car park or meeting point. Use the map on this page to help ensure you arrive at the check-in desk with plenty of time to spare.